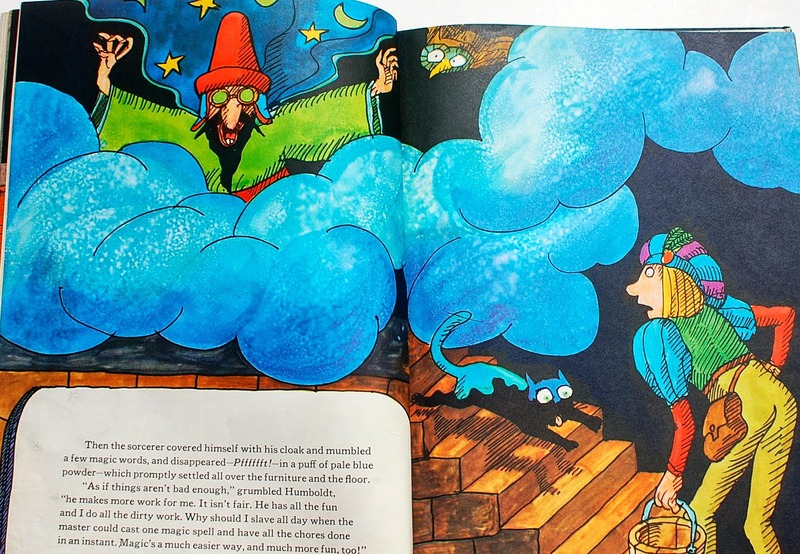 Again, help me in welcoming my good friend, fellow old book collector, and Etsy purveyor of all things vintage modern and awesome, Thingummery as she explores a book illustrated by the magnificent Ungerer and written by the author of the Scarry-illustrated Golden classic Rudolph the Red-Nosed Reindeer. Fabulous! 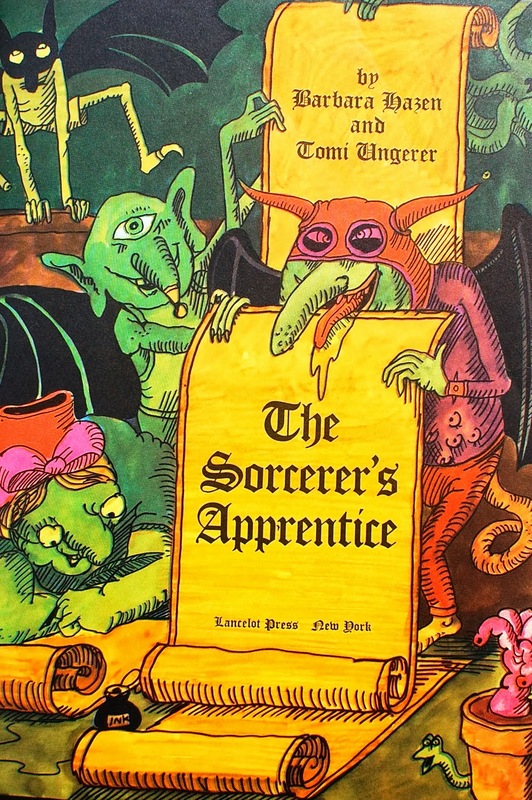 It’s a wonderful thing to go to an estate sale and find a Tomi Ungerer book you didn't even know existed, especially one illustrated at what might be considered the apex of his children’s book illustrating career. 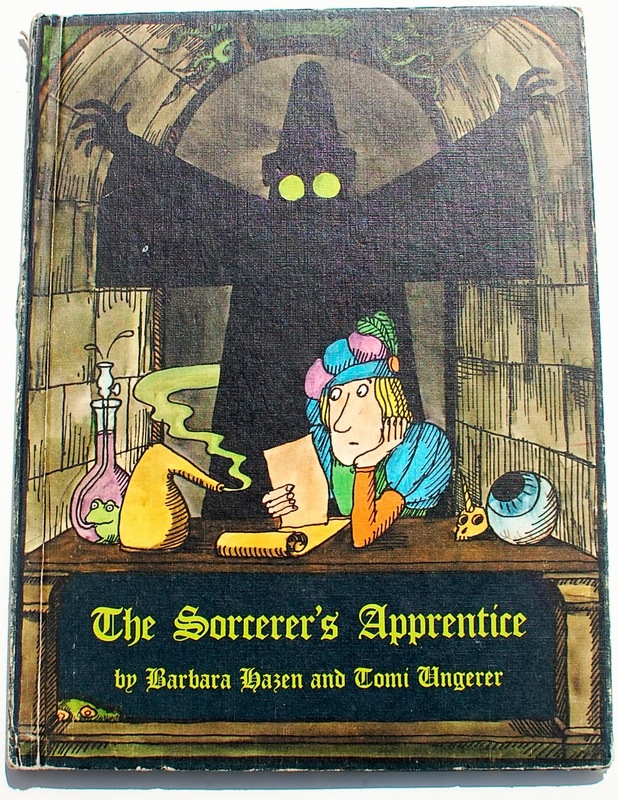 The Sorcerer’s Apprentice was published in 1969, around the same time period as some of my favorites: Moon Man, Zarelda’s Ogre, The Hat, The Beast of Monsieur Racine… But unlike those masterworks, Ungerer didn't write The Sorcerer’s Apprentice; he left that to Barbara Hazen, better known as Barbara Shook Hazen, a midcentury magazine editor turned prolific children’s book author, who has over 80 titles to her credit. Of those many titles, I’m only familiar with two: The Knight Who Was Afraid of the Dark, an old favorite at my house, and Mr. Ed, The Talking Horse (yes, that Mr. Ed, and if you’re interested, I've got a copy for sale at my etsy shop). 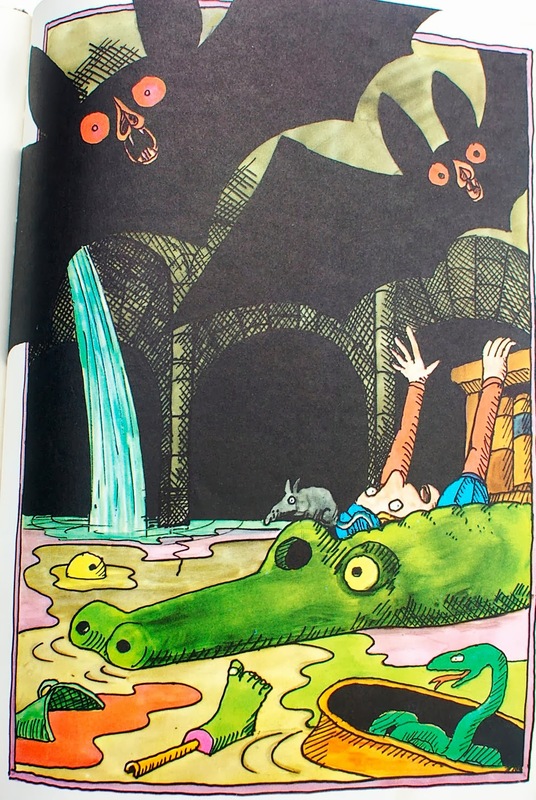 No offense to Ms. Hazen (who I believe is still living and working in NYC), but this book is really about the pictures, which should come as no surprise to Ungerer fans. 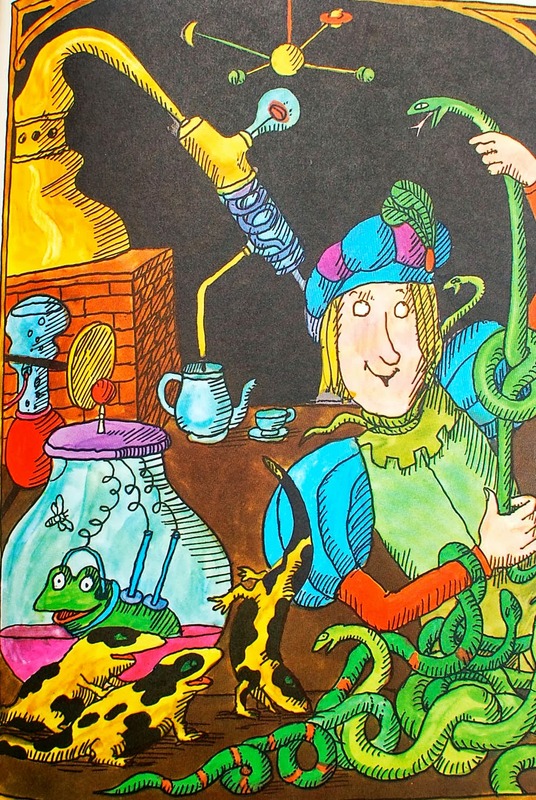 Based on a poem by Goethe—though best known in its Mickey Mouse incarnation—Hazen’s version of the tale of a ne’er-do-well apprentice who unleashes powers he cannot possibly control is a bit overworked and wordy for my taste (my kids think I’m being a snob). 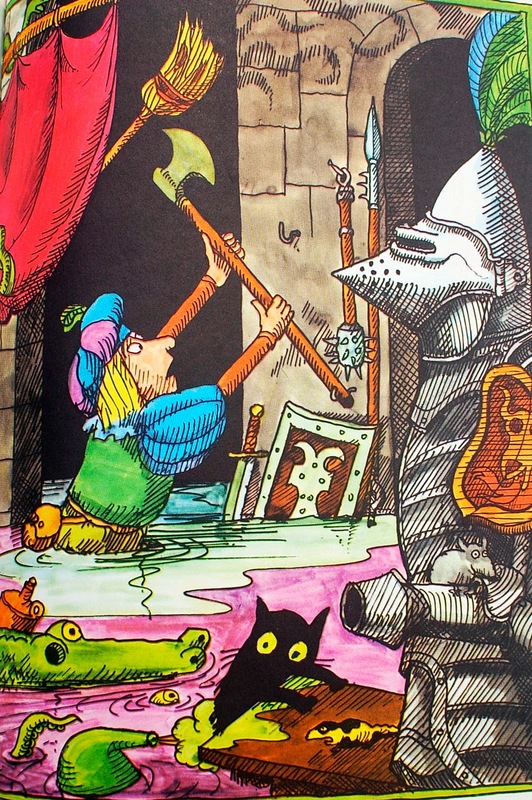 Probably anyone’s prose would seem colorless next to these illustrations, which are classic Ungerer: trippy, witty and always with a deep, dark underbelly. Full of cockeyed references to previous books, disembodied body parts and loopy creatures. 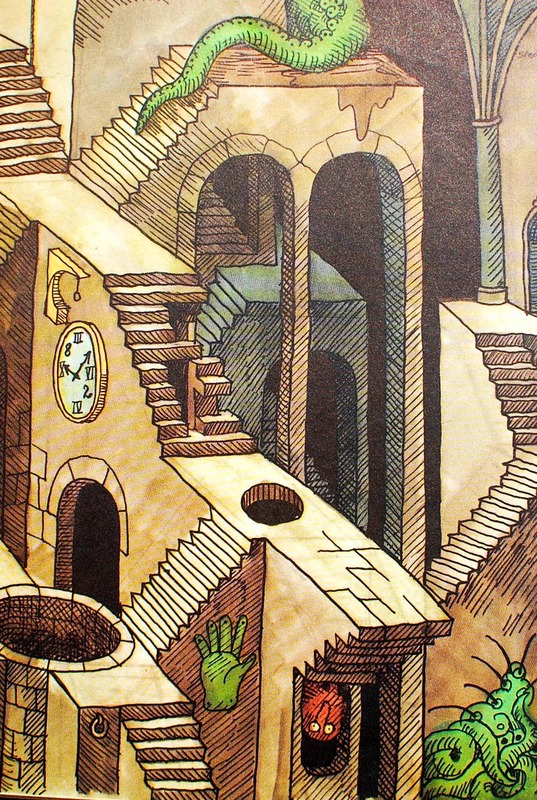 Kind of like Highlights magazine’s “Hidden Pictures” reimagined by a very sinister mind. The broom alone is terrifying. The cellar was the sorcerer’s workshop. One side of the cellar was lined with shelves of musty, dusty, leather-bound books. 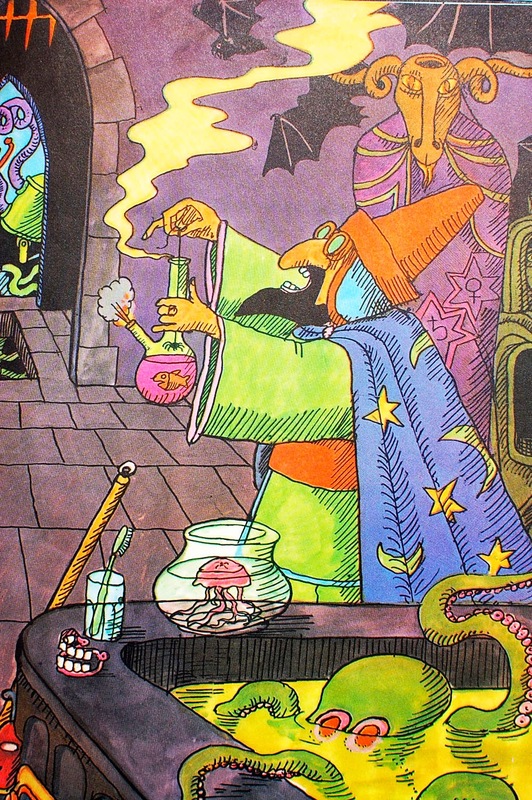 By far the most important book of all was an enormous volume called Complete Magic Spells and Incantations... 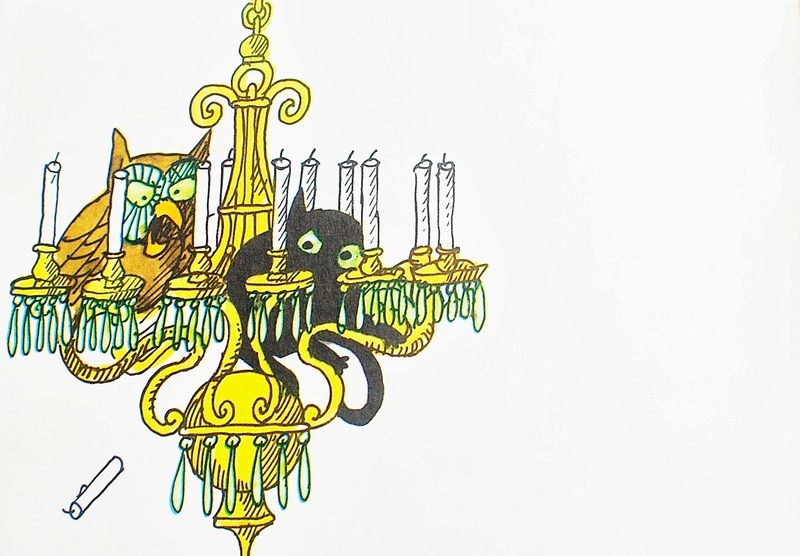 The book stood alone on the top shelf, where it was guarded day and night by an old green-eyed owl. 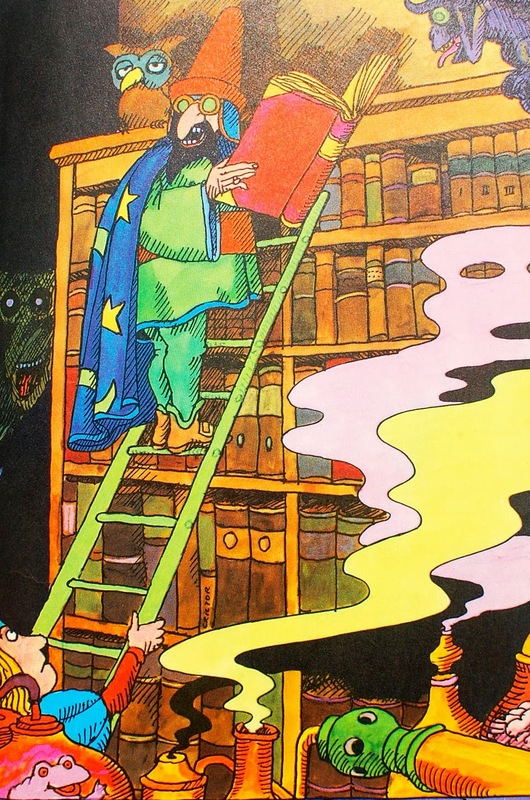 The book was always locked, and the sorcerer always wore the key around his neck. In the middle of the workshop was a water tub. Every day the tub had to be filled. Heavy buckets of water had to be brought all the way up the steep stone steps which led from the River Rhine. 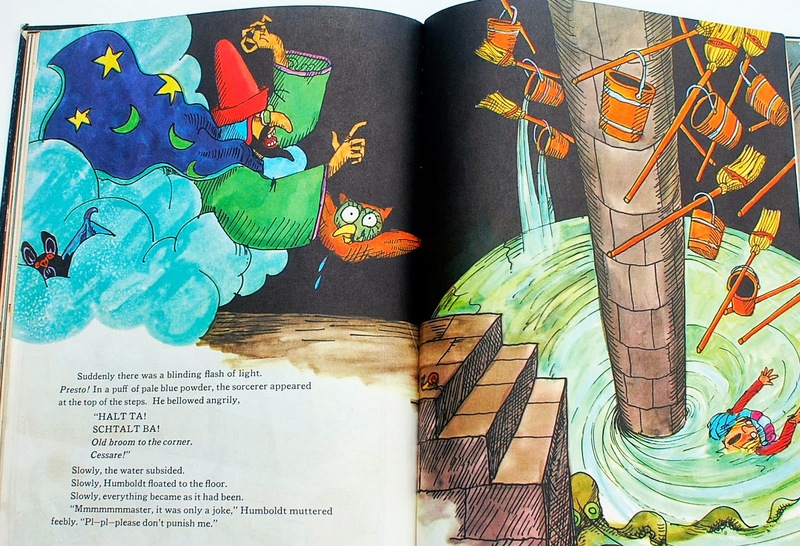 Enter the Sorcerer’s Apprentice, the hapless Humboldt, whose task it is to tote those heavy buckets of water every day. Humboldt aspires to wizardhood, but he’s a total slacker so the sorcerer really has to ride him. “An apprentice must work. An apprentice must learn. An apprentice must earn his magic powers,” he chides, before heading off to a wizard conclave and leaving Humboldt to hold down the fort. The foolish boy calls out the spell and all hell breaks loose. The guardian owl awakens and knocks him off the ladder. The ladder crashed and broke in two. 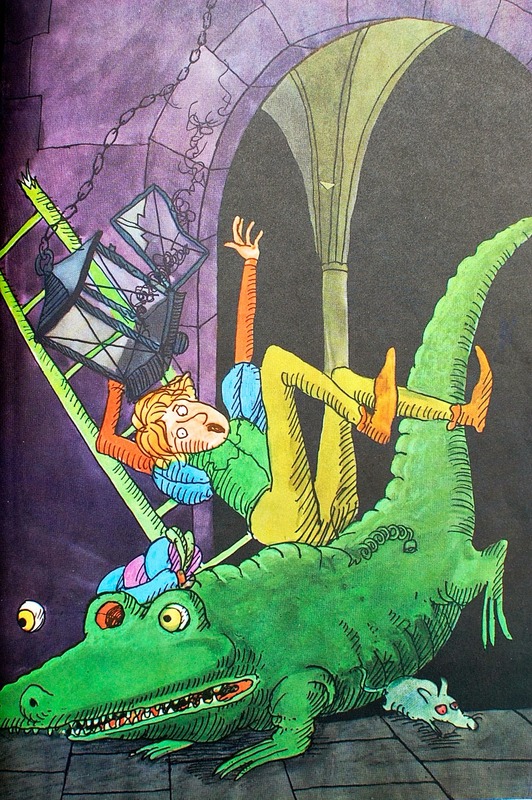 But luckily Humboldt landed unhurt, cushioned by the sorcerer’s stuffed crocodile. Humboldt lay there stunned. At first nothing happened. Had he said the wrong magic words? Things really start to spiral out of control; the cellar begins to flood and Humboldt can’t undo the spell. The water was now waist high. The cat was climbing the furniture and the snakes were slithering up the draperies. Scared and soaked to the skin, Humboldt knew he had to do something to stop the broom. He grabbed the sorcerer’s axe. 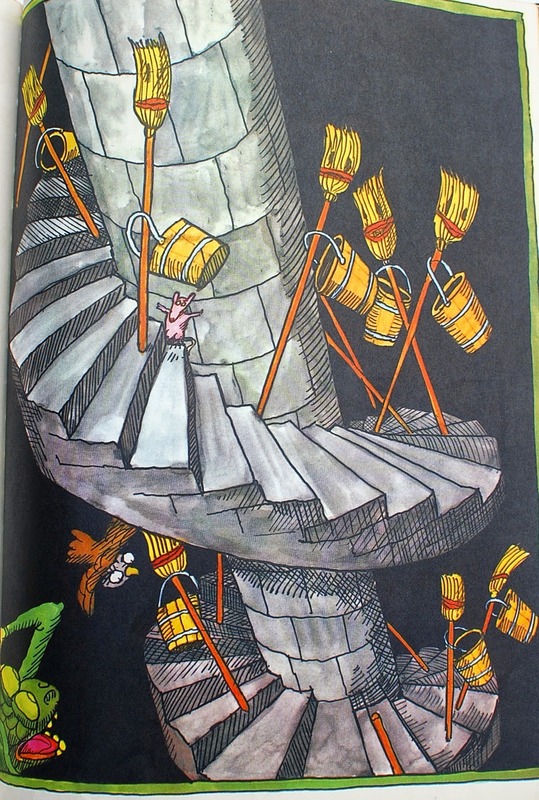 He cuts the broom in two, which only results in…more brooms. Way more creepy-faced brooms. By now the flood had reached the top shelf of the bookcase. 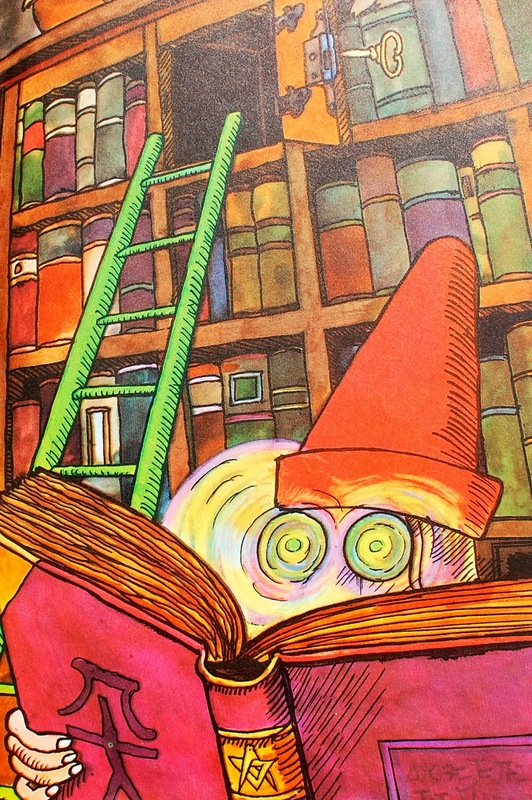 Humboldt was swimming for his life, and trying to catch the magic book, bobbing always just out of reach. 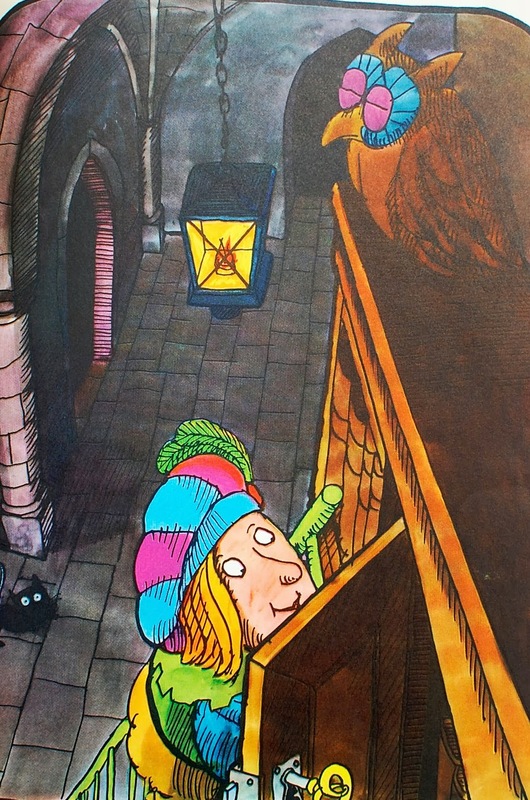 Just the kind of absurdist ending we expect from a Tomi Ungerer book.